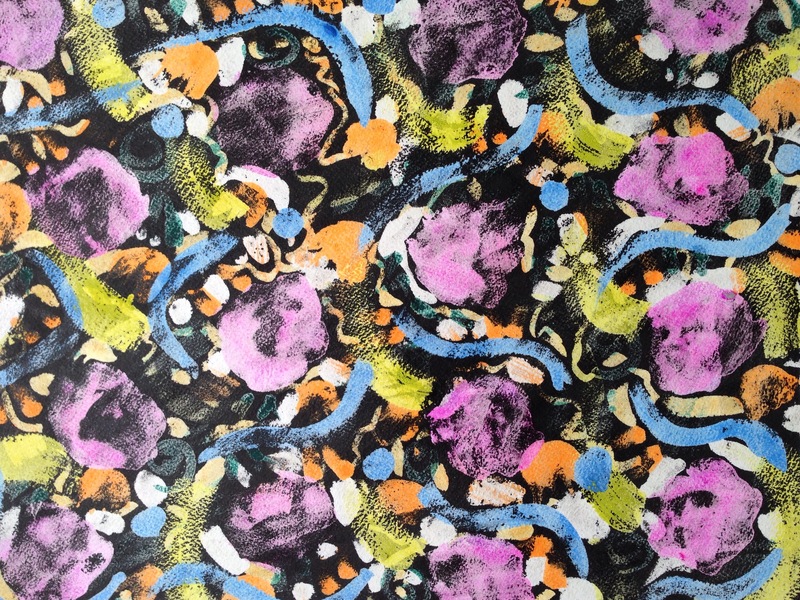 I tried another pattern painting, this time in gouache so I could do a resist on it. The fun part is going back in and going wild with color. 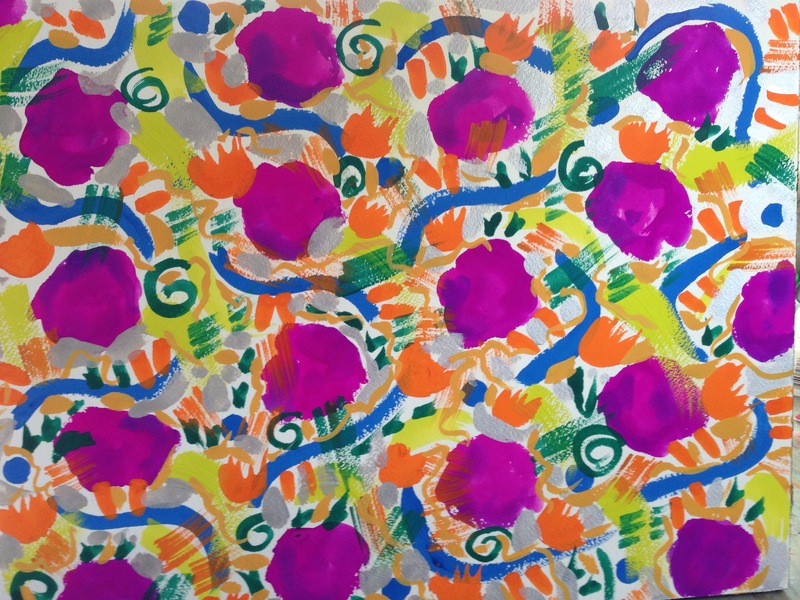 I turned the purple blotches into roses of a sort. An enjoyable thing to do on a beautiful Sunday! Something a little different for me. It reminds me of my days as a colorist in the polyester print business many years ago. This was a fun piece and I think I may do some more of these. It’s larger than I usually do: 12″x16″, cold pressed Arches paper. I’ve been reading “Imaginary Animals” by Boria Sax, which is a goldmine of ideas, especially for my junk mail art. The above creature on the right is based on the Iroquois monster Flying Head: a giant head with wings instead of ears, long tangled hair, sharp teeth, and one set of reptilian arms or legs. A little digging around online reveals a bunch of tribal stories about this man-eating beast. In one, the Flying Head drove an ancient tribe away from its hunting grounds in the Adirondacks and the land was always afterwards considered cursed. Three hotels have been built on that location; all have mysteriously burned down. A common element in many tales involves a woman eating acorns roasted in a fire which is supposed to have finally driven the monster away, as it was scared of a human who could seemingly eat hot coals. This drawing is the Bureau of Indian Affairs ethnographic sketch that sparked my interest. Rather Edward Gorey-like, no? A work drawing of some railroad tracks that are probably unused due to detritus on the tracks. Happy Friday! Have a great weekend, beautiful WP friends. pushing me back through this day. As to the poem, I had gotten a children’s book of sijo poetry out of the library (Tap Dancing on the Roof), and was interested to try the form. Originally a Korean song in 3 lines, modern poets sometimes break it into 6, which worked better for me. Numbers of syllables are involved, and the last line is supposed to provide a twist on the first two. You can read more about writing a sijo here. Two Lantern poems (isn’t that a great name? and the shape!) as suggested by Jane Dougherty in her weekly challenge. You may remember that I ended up leaving my self portrait #12 open for the insertion of new masks, and for this second one I used another Native American reference: Northwest Coast raven moon masks. Raven and Moon are important in tribal life. Raven is the creator of light, a trickster who stole the stars, moon, and sun, and put them in the sky. Moon, a transformational symbol, is both protector and spirit guide. The original mask was based on Hopi Kachina dolls. I’m not sure if we’re still designating the 25th of each month as selfie day, but if so, why not a mask? You can read the story of how Raven stole light for the world here. And all the posts so far in 100 Self Portraits are here. Your daily dose of popular culture. It took Adam six months to get his tattoo. It took me twenty five minutes to do this drawing. Ha! Maybe I should learn tattooing. 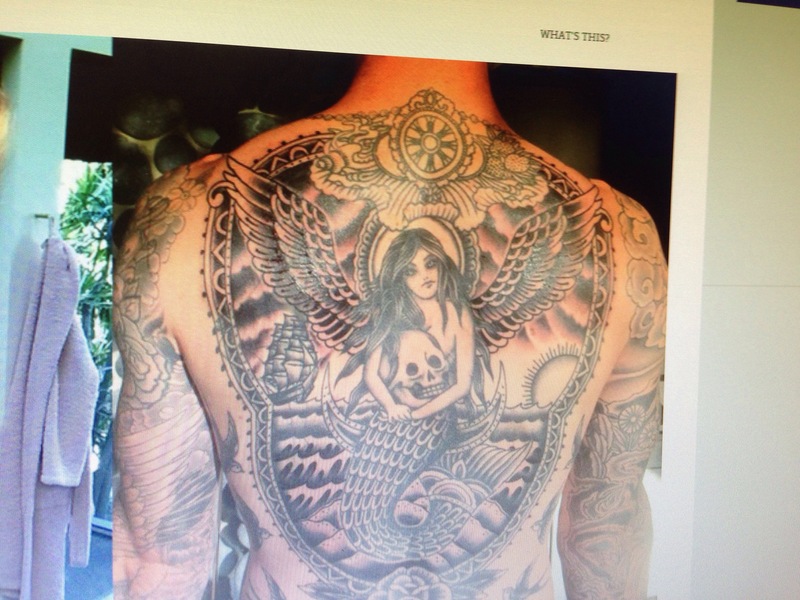 Here is his actual back tattoo. Really incredible detailing although I’m not a fan of tattoos. What is the color of mourning? of empty spaces, and Where? black, but it has no reply. killed. More shots from another gun. 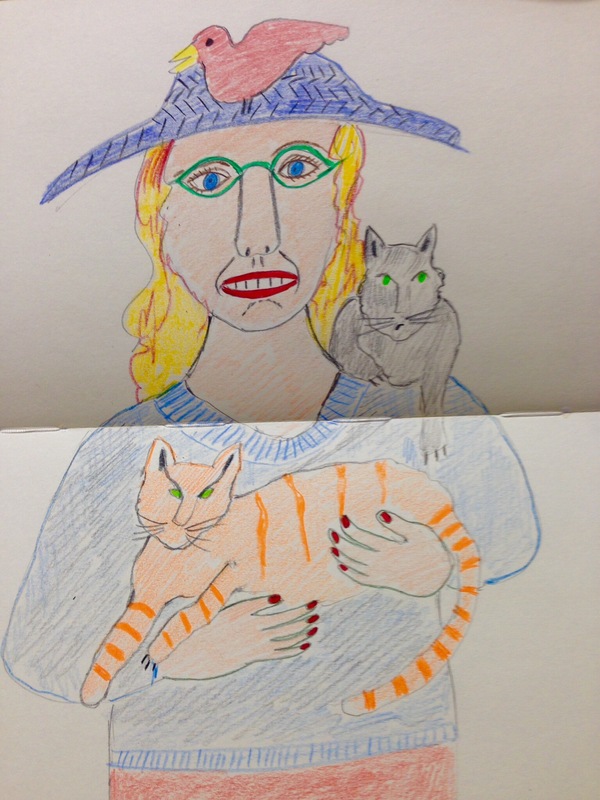 A goof off drawing in my work sketchbook (which is almost all finished) of a woman with her two cats and a bird on her hat. Because why not? I couldn’t find my trusty black felt tip pen. This drawing really needs a black outline.